The Population at Risk in Crime Analysis: A Role for Big Data? 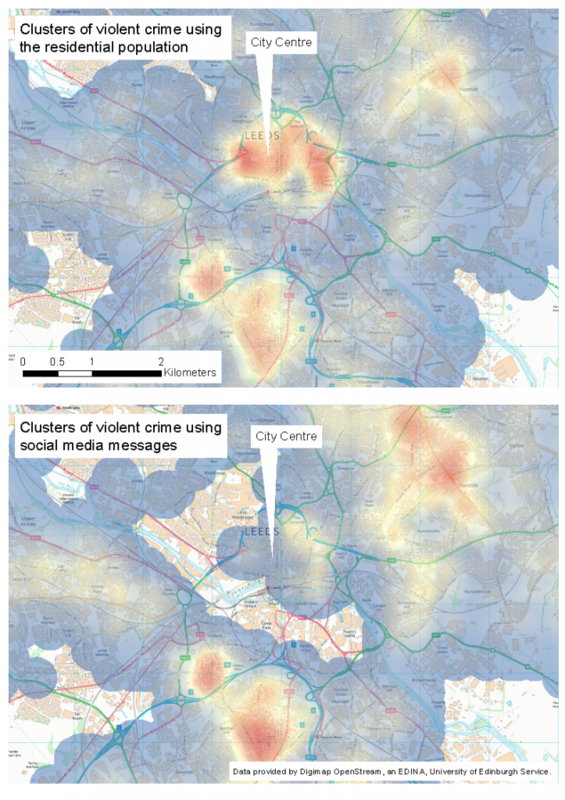 Following on from a post about using big data to understand urban movements, I’ve recently been looking at ways of using data from social media to better understand where and when groups of people might be vulnerable to crime. This is important because if we don’t know who the potential victims are, it is not possible to tell whether or not a crime hot-spot is a significant problem. 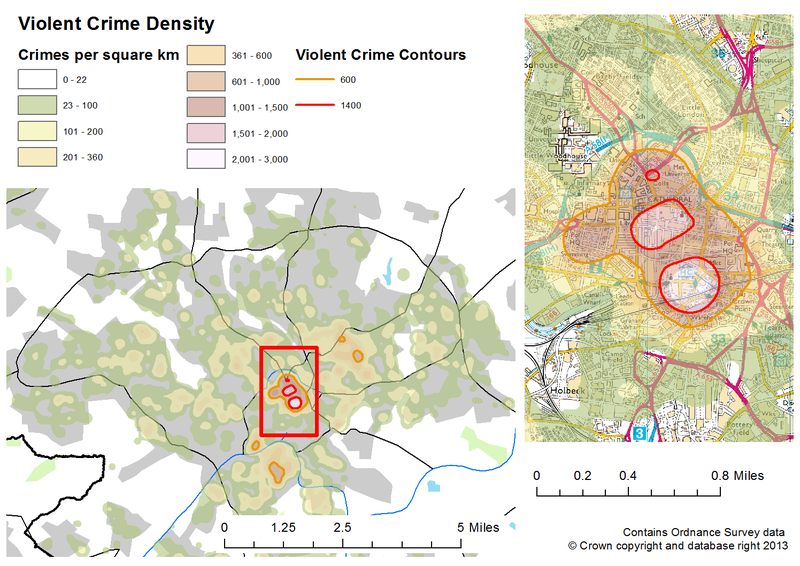 For example, the image on the left shows violent crime in Leeds (all data are from police.uk). The volume is highest in the city centre, but perhaps this is to be expected given the number of people who visit the area. New ‘crowd-sourced’ data might offer a solution. User-contributed data on sites like Flickr, Twitter and Foursquare often have geographic information associated with them so it is possible to build estimates of where people are, and when. My recent research suggests that when the volume of social media messages – rather than the residential population – is used as a proxy for the population at risk then previously significant crime hot spots disappear. Those remaining, which have a significantly greater volume of violent crime than would be expected given the number of potential victims, are arguably those that crime analysts need to focus on specifically. The image below shows some of the results. When using social media messages to measure the potential victims the city centre hot spot vanishes. This could be extremely useful for organisations that attempt to reduce crime rates; it tells them that although there is a lot of crime in the city centre, it isn’t higher than you might expect given the number of people in the area. So whatever you are doing seems to be working! There are lots of problems with the social media data, particularly bias and representation (will these data capture the behaviour of all sections of society?). But if we can get round some of these problems it has strong potential to help us better understand the world.